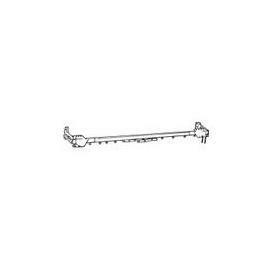 Cord draw traverse rod set with 9003 track, by Kirsch -- BasicQ Inc. Custom drapery rods. This is an assembled Cut To Measure set. Complete set includes brackets, cord, carriers and cord hold down. Truck shipping not included on lengths over 104". On Size selected less than 105"
Return to Wall --select-- None 2" 3" 4" 5" 6" 7" 8"